The new version of ASP.NET Web Forms introduces a number of improvements focused on improving user experience when working with data. In previous versions of Web Forms, when using data-binding to emit the value of an object member, you used the data-binding expressions Bind() or Eval(). 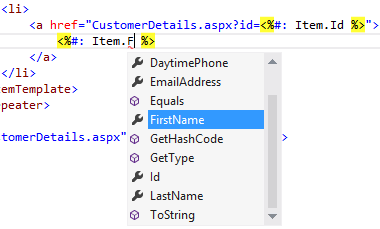 In the new version of ASP.NET, you are able to declare what type of data a control is going to be bound to by using a new ItemType property. Setting this property will enable you to use a strongly-typed variable to receive the full benefits of the Visual Studio development experience, such as IntelliSense, member navigation, and compile-time checking. With the data-bound controls, you can now also specify your own custom methods for selecting, updating, deleting and inserting data, simplifying the interaction between the page controls and your application logic. Additionally, model binding capabilities have been added to ASP.NET, which means you can map data from the page directly into method type parameters. In the request validation area, improvements have been made to make it easier to selectively turn off request validation for specific parts of your applications or read invalidated request data. The TextMode property of the TextBox control has been updated to support the new HTML5 input types like email, datetime, and so on. The FileUpload control now supports multiple file uploads from browsers that support this HTML5 feature. Validator controls now support validating HTML5 input elements. New HTML5 elements that have attributes that represent a URL now support runat="server". As a result, you can use ASP.NET conventions in URL paths, like the ~ operator to represent the application root (for example, <video runat="server" src="~/myVideo.wmv"></video>). The UpdatePanel control has been fixed to support posting HTML5 input fields. All sample code and snippets are included in the Web Camps Training Kit, available at https://go.microsoft.com/fwlink/?LinkID=248297&clcid=0x409. 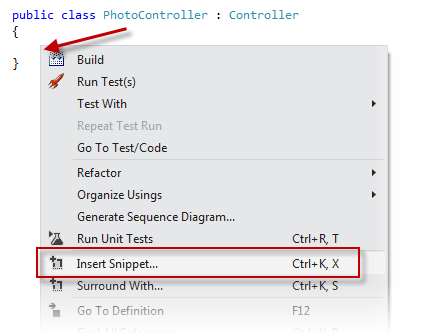 If you are not familiar with the Visual Studio Code Snippets, and want to learn how to use them, you can refer to the appendix from this document "Appendix C: Using Code Snippets". The new version of ASP.NET Web Forms introduces a number of enhancements focused on improving the experience when working with data. Throughout this exercise, you will learn about strongly typed data-controls and model binding. In this task, you will discover the new strongly-typed bindings available in ASP.NET 4.5. Open the Begin solution located at Source/Ex1-ModelBinding/Begin/ folder. Open the Customers.aspx page. Place an unnumbered list in the main control and include a repeater control inside for listing each customer. Set the repeater name to customersRepeater as shown in the following code. In previous versions of Web Forms, when using data-binding to emit the value of a member on an object you're data-binding to, you would use a data-binding expression, along with a call to the Eval method, passing in the name of the member as a string. At runtime, these calls to Eval will use reflection against the currently bound object to read the value of the member with the given name, and display the result in the HTML. This approach makes it very easy to data-bind against arbitrary, unshaped data. Unfortunately, you lose many of the great development-time experience features in Visual Studio, including IntelliSense for member names, support for navigation (like Go To Definition), and compile-time checking. In the Page_Load method, add code to populate the repeater with the list of customers. The solution uses EntityFramework together with CodeFirst to create and access the database. In the following code, the customersRepeater is bound to a materialized query that returns all the customers from the database. Press F5 to run the solution and go to the Customers page to see the repeater in action. As the solution is using CodeFirst, the database will be created and populated in your local SQL Express instance when running the application. 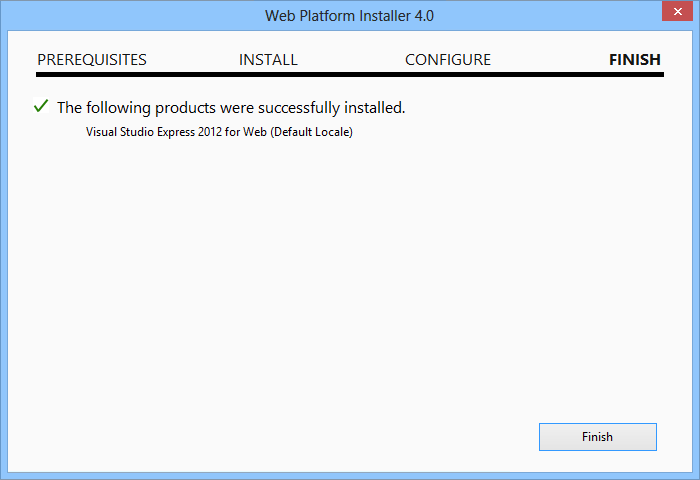 In Visual Studio 2012, IIS Express is the default Web development server. Close the browser and go back to Visual Studio. Now replace the implementation to use strongly typed bindings. 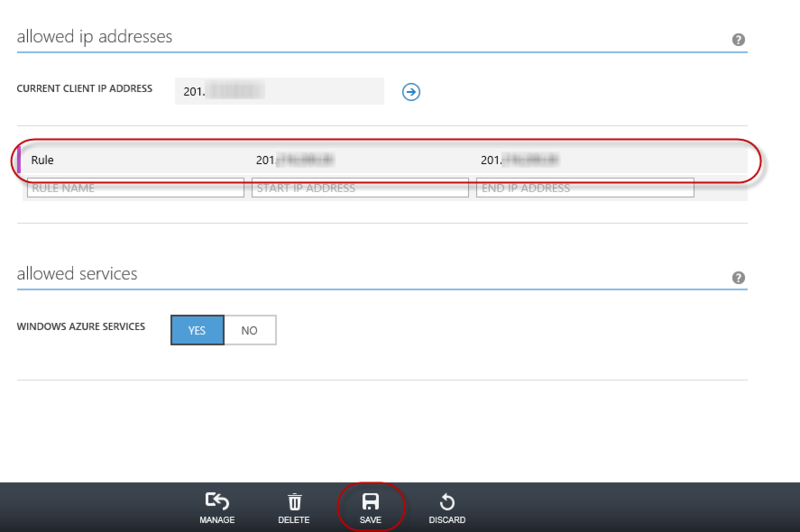 Open the Customers.aspx page and use the new ItemType attribute in the repeater to set the Customer type as the binding type. The ItemType property enables you to declare which type of data the control is going to be bound to and allows you to use strongly-typed binding inside the data-bound control. Replace the ItemTemplate content with the following code. Setting the ItemType property causes two new typed variables to be generated in the scope of the data-binding expressions: Item and BindItem. You can use these strongly typed variables in the data-binding expressions and get the full benefits of the Visual Studio development experience. The ": " used in the expression will automatically HTML-encode the output to avoid security issues (for example, cross-site scripting attacks). This notation was available since .NET 4 for response writing, but now is also available in data-binding expressions. The Item member works for one-way binding. If you want to perform two-way binding use the BindItem member. Press F5 to run the solution and go to the Customers page to make sure the changes work as expected. In previous versions of ASP.NET Web Forms, when you wanted to perform two-way data-binding, both retrieving and updating data, you needed to use a Data Source object. This could be an Object Data Source, a SQL Data Source, a LINQ Data Source and so on. However if your scenario required custom code for handling the data, you needed to use the Object Data Source and this brought some drawbacks. For example, you needed to avoid complex types and you needed to handle exceptions when executing validation logic. In the new version of ASP.NET Web Forms the data-bound controls support model binding. This means that you can specify select, update, insert and delete methods directly in the data-bound control to call logic from your code-behind file or from another class. To learn about this, you will use a GridView to list the product categories using the new SelectMethod attribute. This attribute enables you to specify a method for retrieving the GridView data. Open the Products.aspx page and include a GridView. Configure the GridView as shown below to use strongly-typed bindings and enable sorting and paging. Use the new SelectMethod attribute to configure the GridView to call a GetCategories method to select the data. 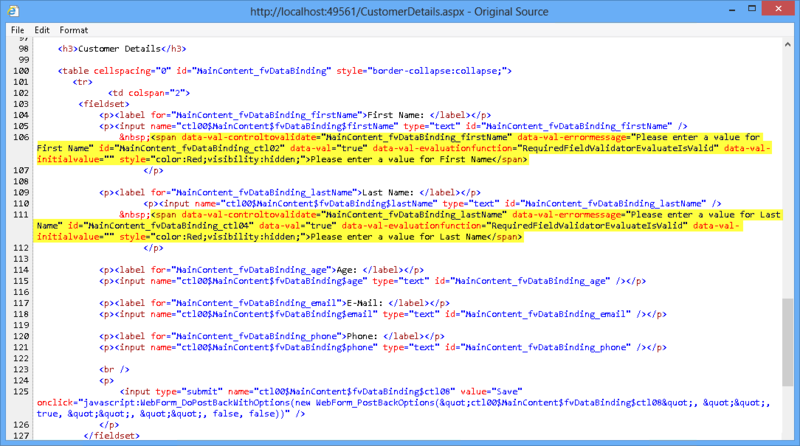 Open the Products.aspx.cs code-behind file and add the following using statements. Add a private member in the Products class and assign a new instance of ProductsContext. This property will store the Entity Framework data context that enables you to connect to the database. 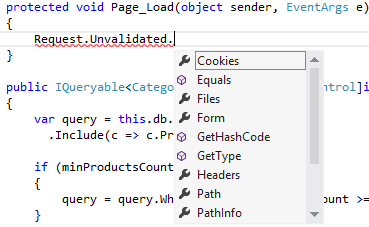 Create a GetCategories method to retrieve the list of categories using LINQ. 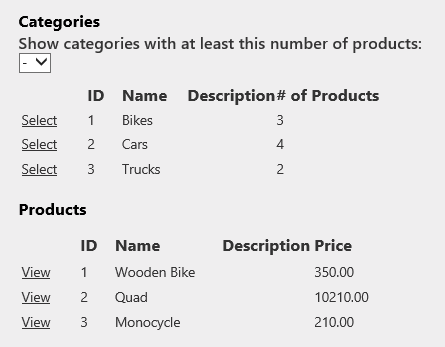 The query will include the Products property so the GridView can show the amount of products for each category. Notice that the method returns a raw IQueryable object that represent the query to be executed later on the page lifecycle. In previous versions of ASP.NET Web Forms, enabling sorting and paging using your own repository logic within an Object Data Source context, required to write your own custom code and receive all the necessary parameters. Now, as the data-binding methods can return IQueryable and this represents a query still to be executed, ASP.NET can take care of modifying the query to add the proper sorting and paging parameters. Press F5 to start debugging the site and go to the Products page. You should see that the GridView is populated with the categories returned by the GetCategories method. If you have used ASP.NET MVC 4, you will notice the model binding support is similar. Indeed, these features were taken from ASP.NET MVC and moved into the System.Web assembly to be able to use them on Web Forms as well. In this task, you will update the GridView to filter its results by the amount of products for each category, receiving the filter parameter with model binding. Go back to the Products.aspx page. At the top of the GridView, add a Label and a ComboBox to select the number of products for each category as shown below. Add an EmptyDataTemplate to the GridView to show a message when there are no categories with the selected number of products. Open the Products.aspx.cs code-behind and add the following using statement. Modify the GetCategories method to receive an integer minProductsCount argument and filter the returned results. To do this, replace the method with the following code. The new [Control] attribute on the minProductsCount argument will let ASP.NET know its value must be populated using a control in the page. ASP.NET will look for any control matching the name of the argument (minProductsCount) and perform the necessary mapping and conversion to fill the parameter with the control value. Alternatively, the attribute provides an overloaded constructor that enables you to specify the control from where to get the value. One goal of the data-binding features is to reduce the amount of code that needs to be written for page interaction. Apart from the [Control] value provider, you can use other model-binding providers in your method parameters. Some of them are listed in the task introduction. Press F5 to start debugging the site and go to the Products page. Select a number of products in the drop-down list and notice how the GridView is now updated. In this task, you will add a second, child GridView to show the products within the selected category. Open the Products.aspx page and update the categories GridView to auto-generate the Select button. Add a second GridView named productsGrid at the bottom. 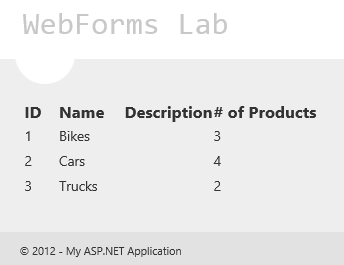 Set the ItemType to WebFormsLab.Model.Product, the DataKeyNames to ProductId and the SelectMethod to GetProducts. Set AutoGenerateColumns to false and add the columns for ProductId, ProductName, Description and UnitPrice. Open the Products.aspx.cs code-behind file. Implement the GetProducts method to receive the category ID from the category GridView and filter the products. Model binding will set the parameter value using the selected row in the categoriesGrid. Since the argument name and control name do not match, you should specify the name of the control in the Control value provider. This approach makes it easier to unit test these methods. On a unit test context, where Web Forms is not executing, the [Control] attribute will not perform any specific action. Open the Products.aspx page and locate the products GridView. Update the products GridView to show a link for editing the selected product. Open the ProductDetails.aspx page code-behind and replace the SelectProduct method with the following code. Notice that the [QueryString] attribute is used to fill the method parameter from a productId parameter in the query string. Press F5 to start debugging the site and go to the Products page. Select any category from the categories GridView and notice that the products GridView is updated. Click the View link on a product to open the ProductDetails.aspx page. Notice that the page is retrieving the product with the SelectMethod using the productId parameter from the query string. 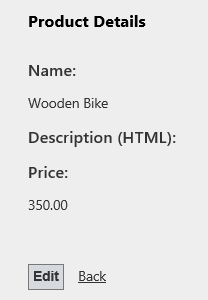 The ability to type an HTML description will be implemented in the next exercise. In the previous task, you have used model binding mainly for selecting data, in this task you will learn how to use model binding in update operations. You will update the categories GridView to let the user update categories. Open the Products.aspx page and update the categories GridView to auto-generate the Edit button and use the new UpdateMethod attribute to specify an UpdateCategory method to update the selected item. The DataKeyNames attribute in the GridView define which are the members that uniquely identify the model-bound object and therefore, which are the parameters the update method should at least receive. Open the Products.aspx.cs code-behind file and implement the UpdateCategory method. The method should receive the category ID to load the current category, populate the values from the GridView and then update the category. The new TryUpdateModel method in the Page class is responsible of populating the model object using the values from the controls in the page. In this case, it will replace the updated values from the current GridView row being edited into the category object. The next exercise will explain the usage of the ModelState.IsValid for validating the data entered by the user when editing the object. Run the site and go to the Products page. Edit a category. Type a new name and then click Update to persist the changes. In this exercise, you will learn about the new data validation features in ASP.NET 4.5. 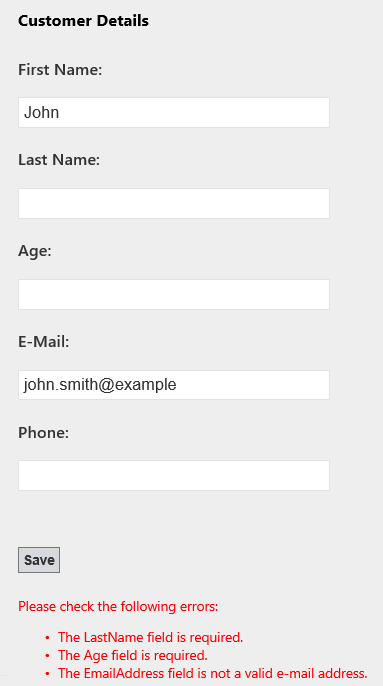 You will check out the new unobtrusive validation features in Web Forms. You will use data annotations in the application model classes for user input validation, and finally, you will learn how to turn on or off request validation to individual controls in a page. In this section, you will enable unobtrusive validation in ASP.NET to compare the HTML code generated by both configurations. 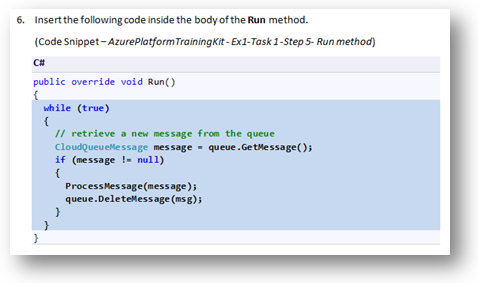 Open Visual Studio 2012 and open the Begin solution located in the Source\Ex2-Validation\Begin folder of this lab. Alternatively, you can continue working on your existing solution from the previous exercise. If you opened the provided Begin solution, you will need to download some missing NuGet packages before continue. 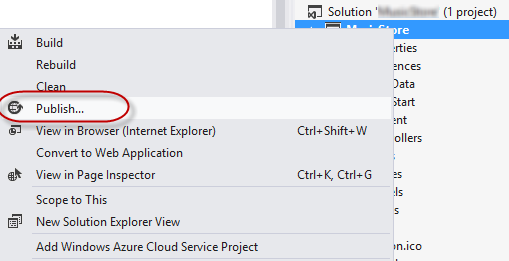 To do this, in the Solution Explorer, click the WebFormsLab project Manage NuGet Packages. Press F5 to start the web application. Go to the Customers page and click the Add a New Customer link. Right-click on the browser page, and select View Source option to open the HTML code generated by the application. Now you will enable unobtrusive validation. Open Web.Config and locate ValidationSettings:UnobtrusiveValidationMode key in the AppSettings section . 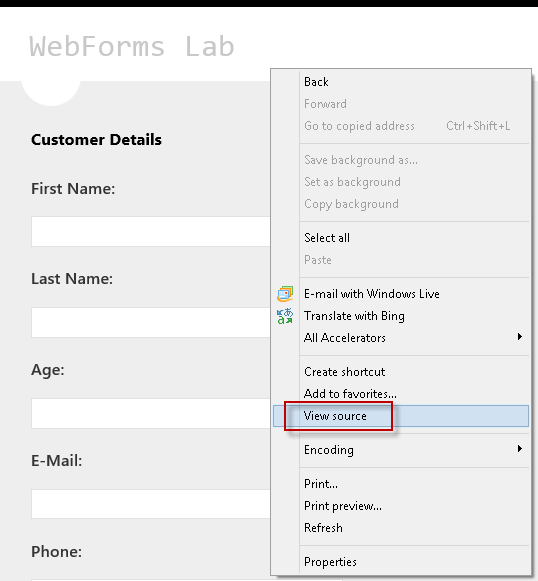 Set the key value to WebForms. You can also set this property in the "Page_Load" event in case you want to enable Unobtrusive Validation only for some pages. Open CustomerDetails.aspx and press F5 to start the Web application. Press the F12 key to open the IE developer tools. Once the developer tools is open, select the script tab. Select CustomerDetails.aspx from the menu and take note that the scripts required to run jQuery on the page have been loaded into the browser from the local site. Close the browser to return to Visual Studio. Open the Site.Master file again and locate the ScriptManager. Add the attribute EnableCdn property with the value True. This will force jQuery to be loaded from the online URL, not from the local site's URL. ASP.NET 4.5 introduces data annotations validation for Web Forms. Instead of having a validation control on each input, you can now define constraints in your model classes and use them across all your web application. In this section, you will learn how to use data annotations for validating a new/edit customer form. Open CustomerDetail.aspx page. 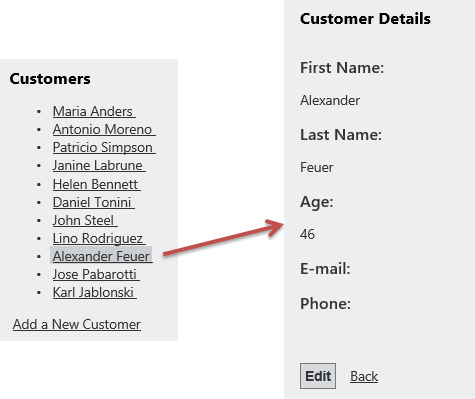 Notice that the customer first name and second name in the EditItemTemplate and InsertItemTemplate sections are validated using a RequiredFieldValidator controls. Each validator is associated to a particular condition, so you need to include as many validators as conditions to check. Add data annotations to validate the Customer model class. Open Customer.cs class in the Model folder and decorate each property using data annotation attributes. .NET Framework 4.5 has extended the existing data annotation collection. These are some of the data annotations you can use: [CreditCard], [Phone], [EmailAddress], [Range], [Compare], [Url], [FileExtensions], [Required], [Key], [RegularExpression]. [EmailAddress(ErrorMessage="Invalid Email"), MaxLength(56)]: Two annotations in the same line. You can also define your own error messages within each attribute. 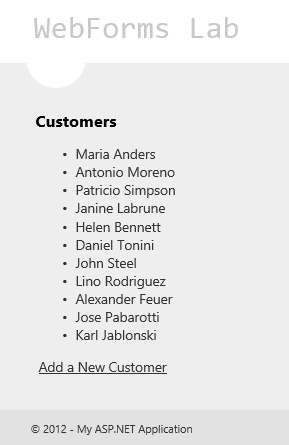 Open CustomerDetails.aspx and remove all the RequiredFieldValidators for the first and last name fields in the in EditItemTemplate and InsertItemTemplate sections of the FormView control. One advantage of using data annotations is that validation logic is not duplicated in your application pages. You define it once in the model, and use it across all the application pages that manipulate data. Open CustomerDetails.aspx code-behind and locate the SaveCustomer method. This method is called when inserting a new customer and receives the Customer parameter from the FormView control values. When the mapping between the page controls and the parameter object occurs, ASP.NET will execute the model validation against all the data annotation attributes and fill the ModelState dictionary with the errors encountered, if any. The ModelState.IsValid will only return true if all the fields on your model are valid after performing the validation. Add a ValidationSummary control at the end of the CustomerDetails page to show the list of model errors. The ShowModelStateErrors is a new property on the ValidationSummary control that when set to true, the control will show the errors from the ModelState dictionary. These errors come from the data annotations validation. Press F5 to run the Web application. Complete the form with some erroneous values and click Save to execute validation. Notice the error summary at the bottom. In previous version of Web Forms, handling database errors such as a too long string or a unique key violation could involve throwing exceptions in your repository code and then handling the exceptions on your code-behind to display an error. A great amount of code is required to do something relatively simple. 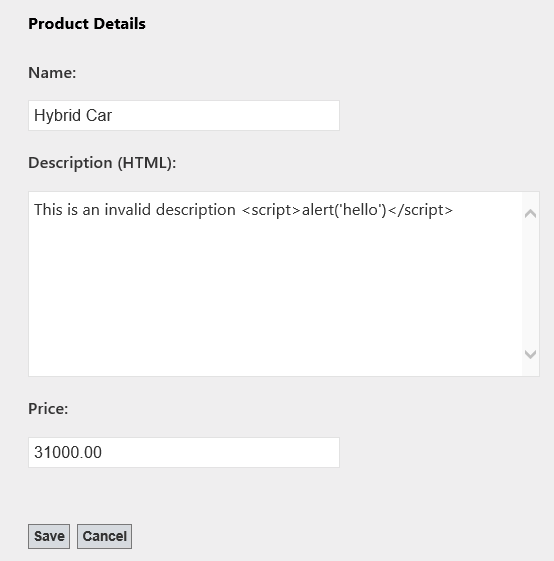 In Web Forms 4.5, the ModelState object can be used to display the errors on the page, either from your model or from the database, in a consistent manner. In this task, you will add code to properly handle database exceptions and show the appropriate message to the user using the ModelState object. While the application is still running, try to update the name of a category using a duplicated value. Notice that an exception is thrown due to the "unique" constraint of the CategoryName column. Stop debugging. 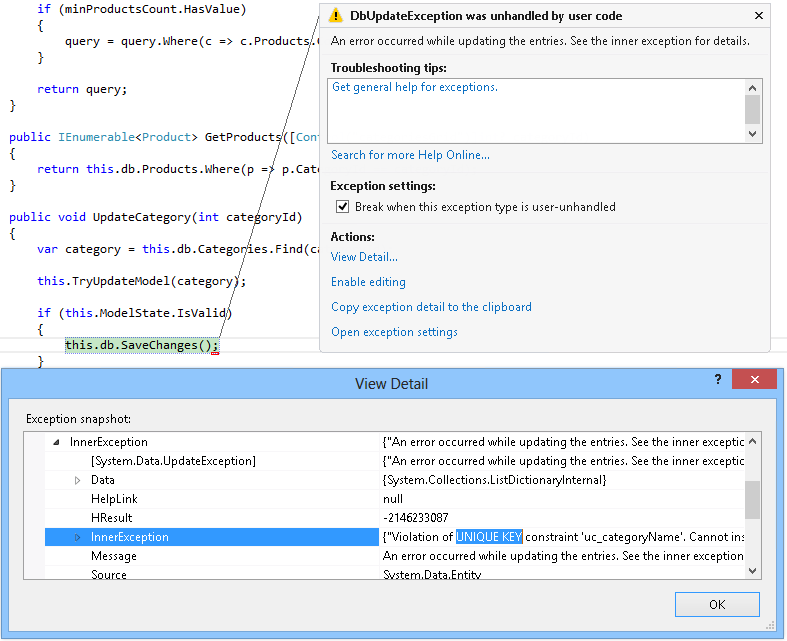 In the Products.aspx.cs code-behind file, update the UpdateCategory method to handle the exceptions thrown by the db.SaveChanges() method call and add an error to the ModelState object. The new TryUpdateModel method updates the category object retrieved from the database using the form data provided by the user. Ideally, you would have to identify the cause of the DbUpdateException and check if the root cause is the violation of a unique key constraint. Open Products.aspx and add a ValidationSummary control below the categories GridView to show the list of model errors. Run the site and go to the Products page. Try to update the name of a category using an duplicated value. Notice that the exception was handled and the error message appears in the ValidationSummary control. The request validation feature in ASP.NET provides a certain level of default protection against cross-site scripting (XSS) attacks. In previous versions of ASP.NET, request validation was enabled by default and could only be disabled for an entire page. With the new version of ASP.NET Web Forms you can now disable the request validation for a single control, perform lazy request validation or access un-validated request data (be careful if you do so!). Press Ctrl+F5 to start the site without debugging and go to the Products page. Select a category and then click the Edit link on any of the products. Type a description containing potentially dangerous content, for instance including HTML tags. Take notice of the exception thrown due to the request validation. Close the page and, in Visual Studio, press SHIFT+F5 to stop debugging. Open the ProductDetails.aspx page and locate the Description TextBox. Add the new ValidateRequestMode property to the TextBox and set its value to Disabled. The new ValidateRequestMode attribute allows you to disable the request validation granularly on each control. This is useful when you want to use an input that may receive HTML code, but want to keep the validation working for the rest of the page. Press F5 to run the web application. 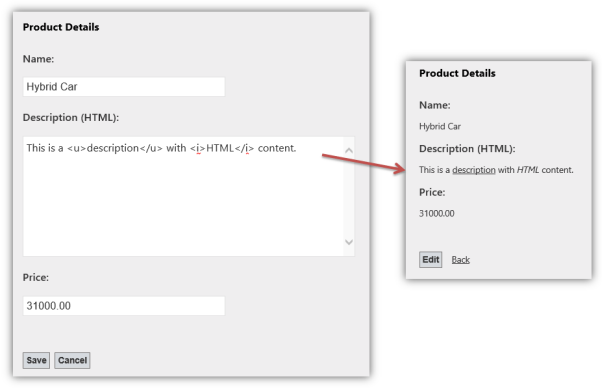 Open the edit product page again and complete a product description including HTML tags. Notice that you can now add HTML content to the description. In a production application, you should sanitize the HTML code entered by the user to make sure only safe HTML tags are entered (for example, there are no <script> tags). To do this, you can use Microsoft Web Protection Library. Edit the product again. Type HTML code in the Name field and click Save. Notice that Request Validation is only disabled for the Description field and the rest of the fields re still validated against the potentially dangerous content. 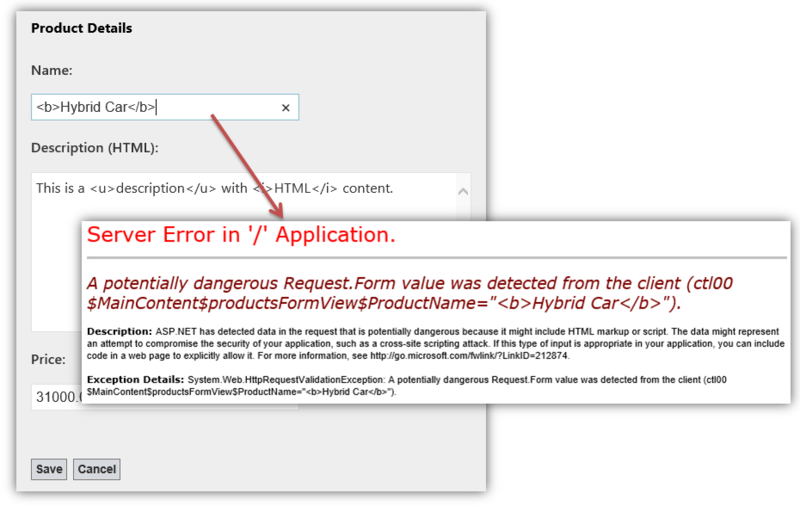 ASP.NET Web Forms 4.5 includes a new request validation mode to perform request validation lazily. With the request validation mode set to 4.5, if a piece of code accesses Request.Form["key"], ASP.NET 4.5's request validation will only trigger request validation for that specific element in the form collection. Additionally, ASP.NET 4.5 now includes core encoding routines from the Microsoft Anti-XSS Library v4.0. The Anti-XSS encoding routines are implemented by the new AntiXssEncoder type found in the new System.Web.Security.AntiXss namespace. With the encoderType parameter configured to use AntiXssEncoder, all output encoding within ASP.NET automatically uses the new encoding routines. ASP.NET 4.5 request validation also supports un-validated access to request data. ASP.NET 4.5 adds a new collection property to the HttpRequest object called Unvalidated. When you navigate into HttpRequest.Unvalidated you have access to all of the common pieces of request data, including Forms, QueryStrings, Cookies, URLs, and so on. Please use the HttpRequest.Unvalidated property with caution! Make sure you carefully perform custom validation on the raw request data to ensure that dangerous text is not round-tripped and rendered back to unsuspecting customers! In this exercise, you will be introduced to the new asynchronous page processing features in ASP.NET Web Forms. In this task, you will update the product details page to allow the user to specify an image URL for the product and display it in the read-only view. You will create a local copy of the specified image by downloading it synchronously. In the next task, you will update this implementation to make it work asynchronously. Open Visual Studio 2012 and load the Begin solution located in Source\Ex3-Async\Begin from this lab's folder. Alternatively, you can continue working on your existing solution from the previous exercises. If you opened the provided Begin solution, you will need to download some missing NuGet packages before continue. 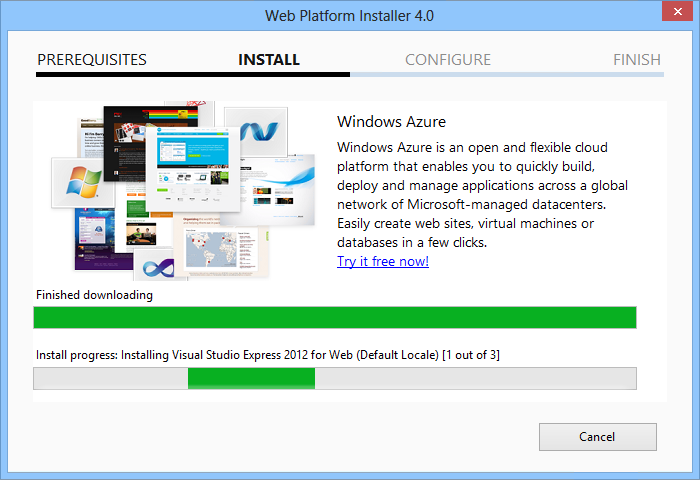 To do this, in the Solution Explorer, click the WebFormsLab project and select Manage NuGet Packages. 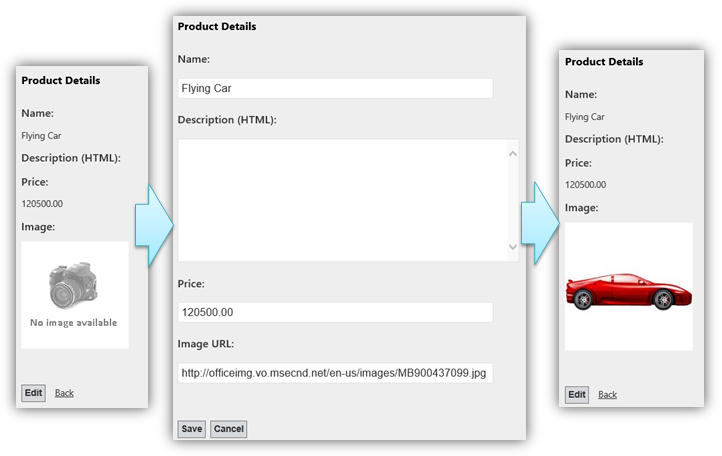 Open the ProductDetails.aspx page source and add a field in the FormView's ItemTemplate to show the product image. Add a field to specify the image URL in the FormView's EditTemplate. Open the ProductDetails.aspx.cs code-behind file and add the following namespace directives. Create an UpdateProductImage method to store remote images in the local Images folder and update the product entity with the new image location value. Update the UpdateProduct method to call the UpdateProductImage method. In this task, you will update the product details page to make it work asynchronously. You will enhance a long running task - the image download process - by using ASP.NET 4.5 asynchronous page processing. Asynchronous methods in web applications can be used to optimize the way ASP.NET thread pools are used. In ASP.NET there are a limited number of threads in the thread pool for attending requests, thus, when all the threads are busy, ASP.NET starts to reject new requests, sends application error messages and makes your site unavailable. Time-consuming operations on your web site are great candidates for asynchronous programming because they occupy the assigned thread for a long time. This includes long running requests, pages with lots of different elements and pages that require offline operations, such querying a database or accessing an external web server. The advantage is that if you use asynchronous methods for these operations, while the page is processing, the thread is freed and returned to the thread pool and can be used to attend to a new page request. This means, the page will start processing in one thread from the thread pool and might complete processing in a different one, after the async processing completes. Open the ProductDetails.aspx page. Add the Async attribute in the Page element and set it to true. 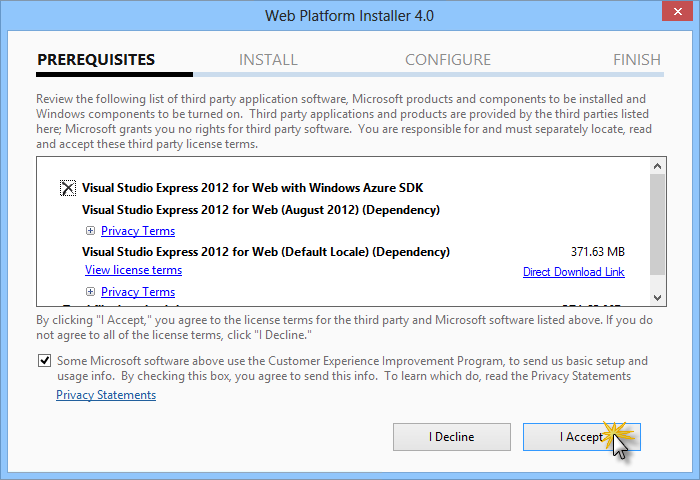 This attribute tells ASP.NET to implement the IHttpAsyncHandler interface. Add a Label at the bottom of the page to show the details of the threads running the page. Open up ProductDetails.aspx.cs and add the following namespace directives. Modify the UpdateProductImage method to download the image with an asynchronous task. You will replace the WebClient DownloadFile method with the DownloadFileTaskAsync method and include the await keyword. The RegisterAsyncTask registers a new page asynchronous task to be executed in a different thread. It receives a lambda expression with the Task (t) to be executed. The await keyword in the DownloadFileTaskAsync method converts the remainder of the method into a callback that is invoked asynchronously after the DownloadFileTaskAsync method has completed. ASP.NET will resume the execution of the method by automatically maintaining all the HTTP request original values. The new asynchronous programming model in .NET 4.5 enables you to write asynchronous code that looks very much like synchronous code, and let the compiler handle the complications of callback functions or continuation code. RegisterAsyncTask and PageAsyncTask were already available since .NET 2.0. The await keyword is new from the .NET 4.5 asynchronous programming model and can be used together with the new TaskAsync methods from the .NET WebClient object. Add code to display the threads on which the code started and finished executing. To do this, update the UpdateProductImage method with the following code. Open the web site's Web.config file. Add the following appSetting variable. Press F5 to run the application and upload an image for the product. Notice the threads ID where the code started and finished may be different. This is because asynchronous tasks run on a separate thread from ASP.NET thread pool. When the task completes, ASP.NET puts the task back in the queue and assigns any of the available threads. 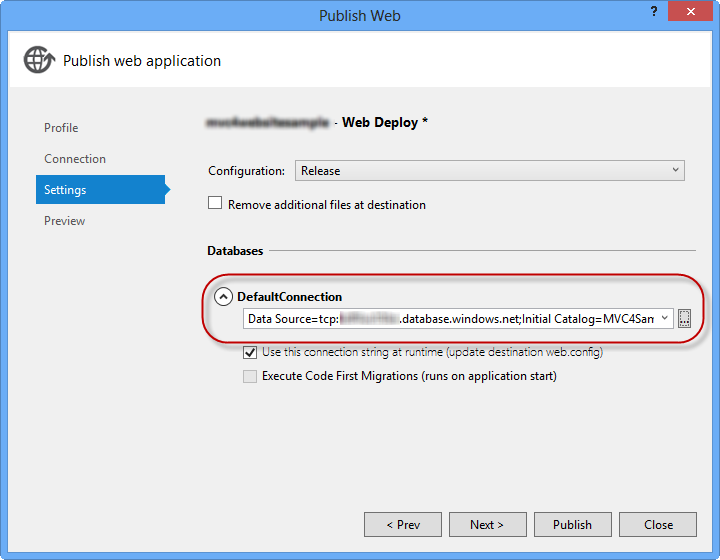 Additionally, you can deploy this application to Azure following Appendix B: Publishing an ASP.NET MVC 4 Application using Web Deploy. Go to [https://go.microsoft.com/?linkid=9810169](https://go.microsoft.com/?linkid=9810169). 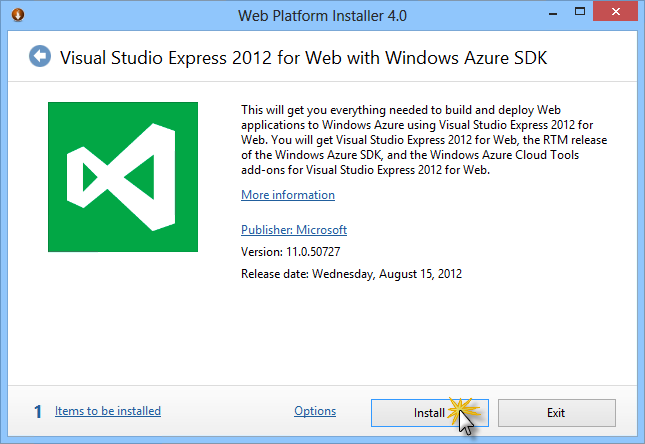 Alternatively, if you already have installed Web Platform Installer, you can open it and search for the product "Visual Studio Express 2012 for Web with Azure SDK". 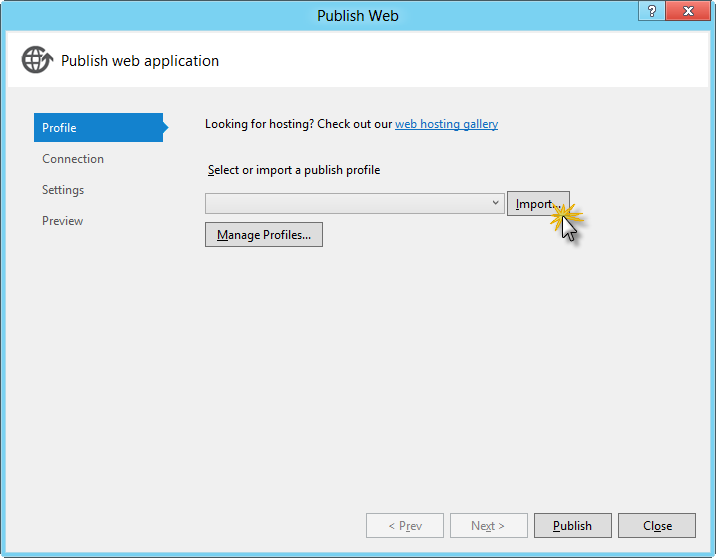 This appendix will show you how to create a new web site from the Azure Portal and publish the application you obtained by following the lab, taking advantage of the Web Deploy publishing feature provided by Azure. 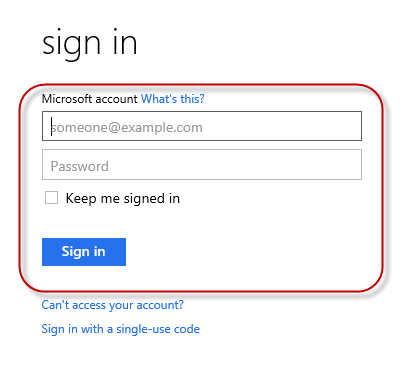 Go to the Azure Management Portal and sign in using the Microsoft credentials associated with your subscription. With Azure you can host 10 ASP.NET Web Sites for free and then scale as your traffic grows. You can sign up here. Click New on the command bar. Click Compute | Web Site. Then select Quick Create option. Provide an available URL for the new web site and click Create Web Site. 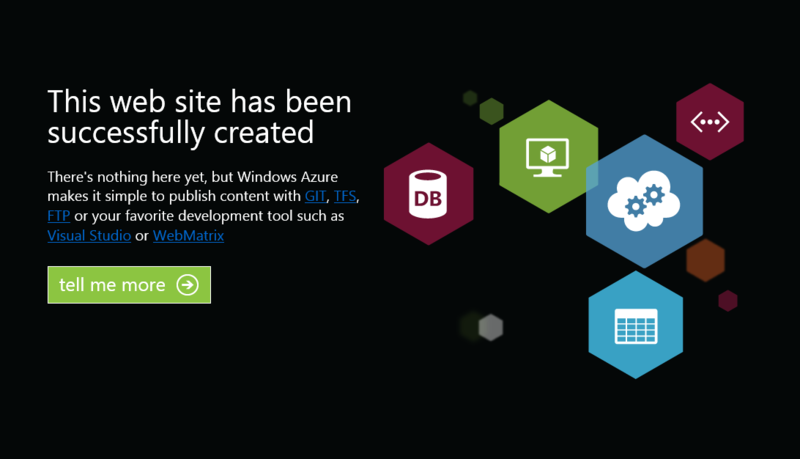 Azure is the host for a web application running in the cloud that you can control and manage. 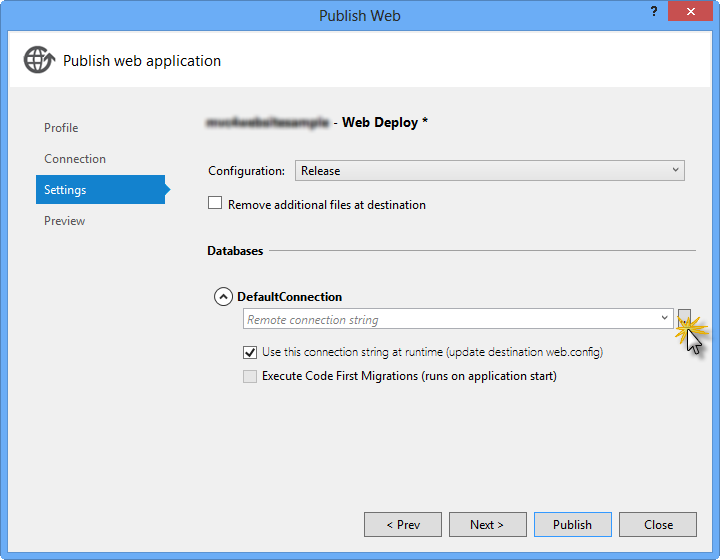 The Quick Create option allows you to deploy a completed web application to the Azure from outside the portal. It does not include steps for setting up a database. Wait until the new Web Site is created. Once the Web Site is created click the link under the URL column. Check that the new Web Site is working. Go back to the portal and click the name of the web site under the Name column to display the management pages. In the Dashboard page, under the quick glance section, click the Download publish profile link. 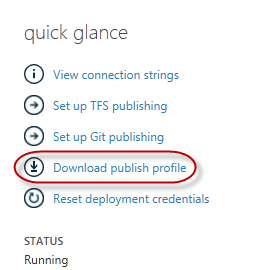 The publish profile contains all of the information required to publish a web application to Azure for each enabled publication method. The publish profile contains the URLs, user credentials and database strings required to connect to and authenticate against each of the endpoints for which a publication method is enabled. 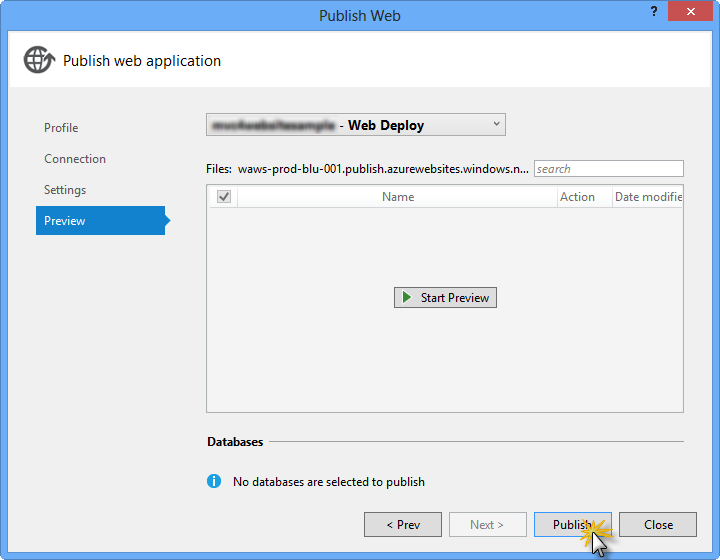 Microsoft WebMatrix 2, Microsoft Visual Studio Express for Web and Microsoft Visual Studio 2012 support reading publish profiles to automate configuration of these programs for publishing web applications to Azure. Download the publish profile file to a known location. 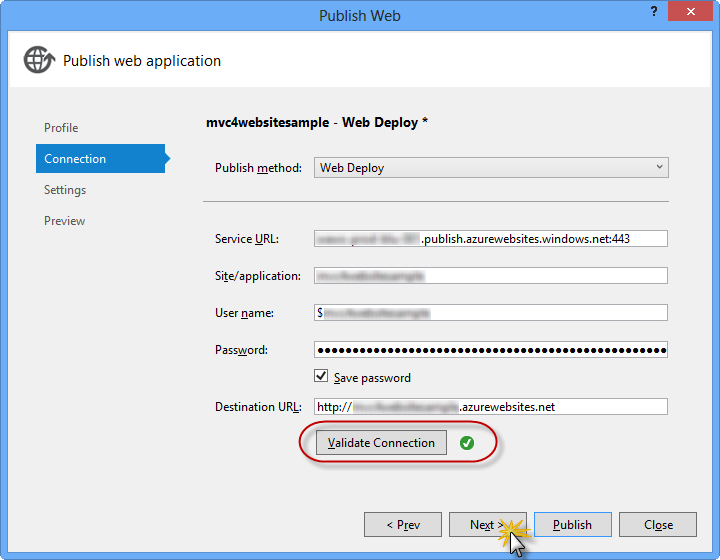 Further in this exercise you will see how to use this file to publish a web application to Azure from Visual Studio. If your application makes use of SQL Server databases you will need to create a SQL Database server. 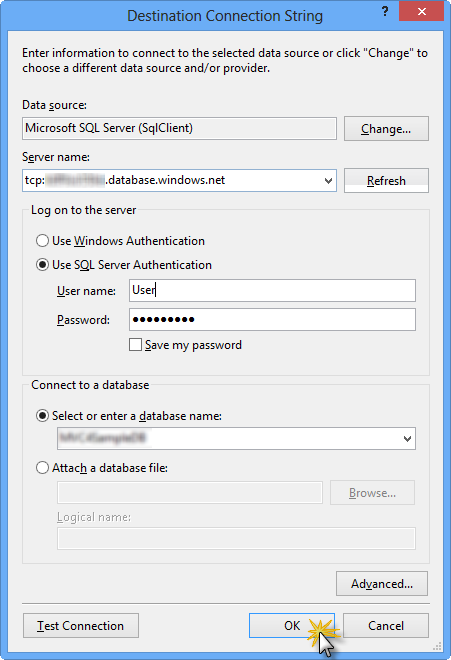 If you want to deploy a simple application that does not use SQL Server you might skip this task. You will need a SQL Database server for storing the application database. 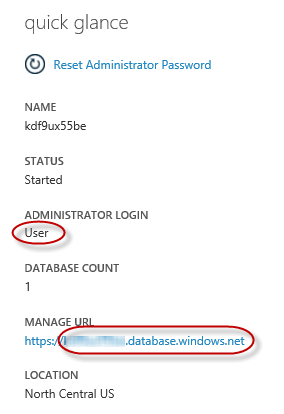 You can view the SQL Database servers from your subscription in the Azure Management portal at Sql Databases | Servers | Server's Dashboard. If you do not have a server created, you can create one using the Add button on the command bar. Take note of the server name and URL, administrator login name and password, as you will use them in the next tasks. Do not create the database yet, as it will be created in a later stage. In the next task you will test the database connection from Visual Studio, for that reason you need to include your local IP address in the server's list of Allowed IP Addresses. To do that, click Configure, select the IP address from Current Client IP Address and paste it on the Start IP Address and End IP Address text boxes and click the button. Once the Client IP Address is added to the allowed IP addresses list, click on Save to confirm the changes. Go back to the ASP.NET MVC 4 solution. In the Solution Explorer, right-click the web site project and select Publish. Import the publish profile you saved in the first task. Click Validate Connection. Once Validation is complete click Next. Validation is complete once you see a green checkmark appear next to the Validate Connection button. In the Settings page, under the Databases section, click the button next to your database connection's textbox (i.e. DefaultConnection). In the Server name type your SQL Database server URL using the tcp: prefix. In User name type your server administrator login name. In Password type your server administrator login password. Type a new database name. Then click OK. When prompted to create the database click Yes. 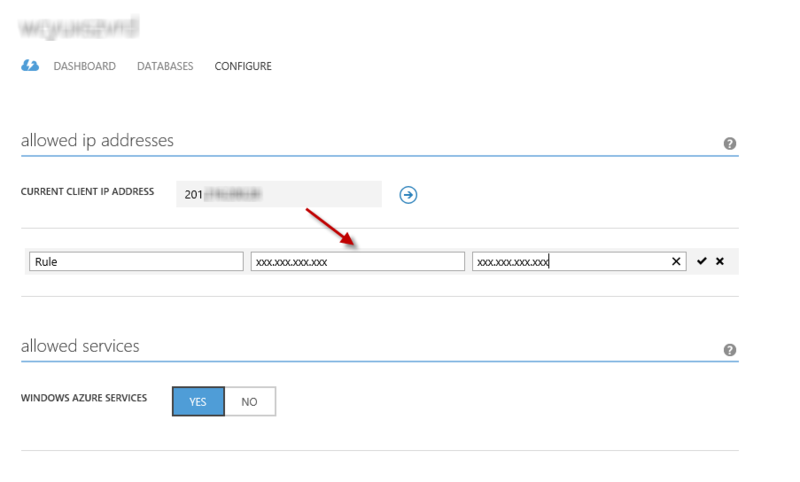 The connection string you will use to connect to SQL Database in Azure is shown within Default Connection textbox. Then click Next. In the Preview page, click Publish. Once the publishing process finishes, your default browser will open the published web site.